This year, during my summer vacation, my family and I visited Delhi to meet our cousins and visit tourist attractions. The day we reached Delhi, Earth day was being celebrated so all the lights were either switched off or reduced, a great way to save electricity, if many people do it even for a short time. The next day, my cousins and I went to one of the Wonders of the World -Taj Mahal. The journey took 3 hours. The magnificent structure took our breaths away,. Next, we visited the national science museum. The next day, we visited India’s tallest stone tower- Qutub Minar, where the Mehrauli pillar was also situated. This fascinating pillar is made of iron and hasn’t rusted for the last 200 years. some people say that if you make a wish while touching it, the wish will come true! We also visited Lal Kila, the famous Red Fort. With the help of an audio guide, we discovered the history and significance of the palace. 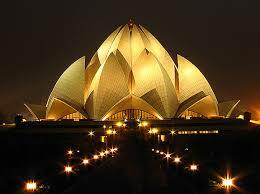 Some days later, I visited the lotus temple, a temple for all religions (Bahai). It was very peaceful and we meditated there. After that we went to Humayun’s tomb. The first of April was the day we came back. Bye Delhi… We came back to Mumbai by a long flight. We were super excited to be back to our home sweet home.